SACRAMENTO – Today, the California Association of Nonprofits hosted California Nonprofits Day at the California State Capitol. Senator Scott Wilk, R-Antelope Valley, chose Carousel Ranch of Santa Clarita as the 21st Senate District’s Nonprofit of the Year. Carousal Ranch opened in 1997 in a backyard with one student. In 2005 directors Becky Graham and Denise Redmond purchased an incredible 10+ acre ranch in Agua Dulce and are now serving more than one hundred students a week. Through community support Carousel Ranch has expanded to include vocational programs as well. “Visiting the Capitol today and receiving this award has been a great honor. We are very appreciative of Senator Wilk for recognizing us as the Nonprofit of the Year but without the amazing support of our Santa Clarita community, the hundreds of students we have seen over the years and of course, our equine business partners, none of what we have accomplished would have been possible,” said Denise Redmond. The 2018 Nonprofit of the Year award winners were chosen based on their long-standing support of the community, civic involvement and dedication to the community in which they are located. 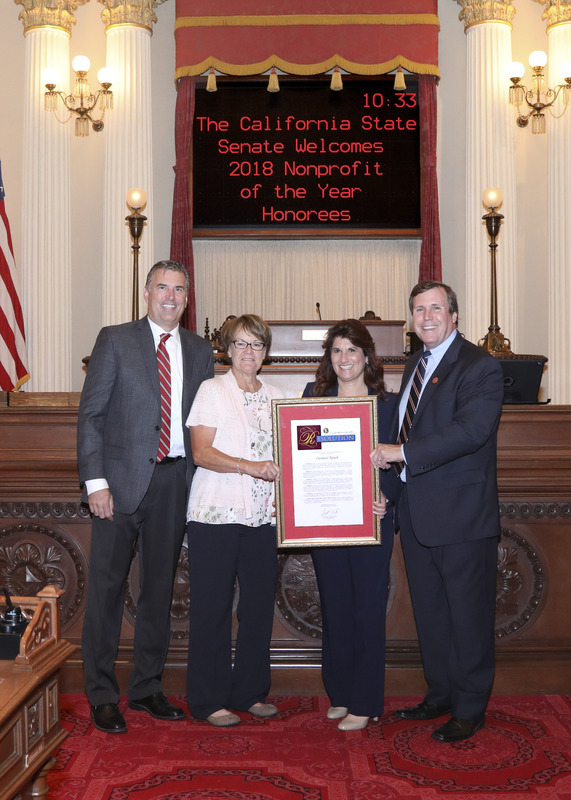 Becky Graham, Denise Redmond and Eric Stroh from Carousel Ranch were in Sacramento to receive the award from Senator Wilk.